With over 25 reviews and rated 4.5 out of 5 stars, see why kids, moms, and educators love ABC’s with Bingzy Bee: Phonics. For a limited time only, through April 1, the app will be available in the App Store for free. Bingzy Bee: Phonics is the 1st animated app for the iPhone/iPod/iPad that teaches the letters and sounds of the alphabet in a catchy, original song, and includes games for kids. I am a preschool special education teacher and use this with my 4-year-olds who are learning letter sounds. The games are educational, keep their focus and is easy for them to manipulate independently. We use this as a reinforcement and learning tool. ABC's with Bingzy Bee: Phonics features Bingzy’s ABC Song, which was developed by an award-winning teacher, Arlene Richards, and used in the classroom for decades with proven success. The app is perfect for PreK and Kindergarten and includes games for kids. "My 3-year-old is still learning her ABC's and this app is helping her tremendously! I'm excited because she can grow with this app. It's not a one time thing." "This game provides children the ability to learn in a game environment. With a catchy tune and fun graphics kids will be learning and not even realize it!" An animated story of Bingzy the Bee, happily skipping along in the forest with balloons. A monkey spots Bingzy and notices something on the balloons. 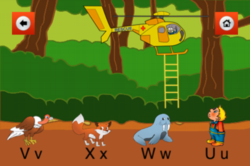 The curious monkey pops the balloons and letters fall out with the names and sounds of Bingzy’s friends in the forest. Bingzy and the monkey soon become friends. Bingzy’s ABC Song is an original, catchy song that will have kids singing the letters and sounds all day long. Vivid animation and graphics that will keep young children entertained. Letter Drag & Drop Game helps to reinforce the letters and their sounds of the alphabet learned in the song. Bingzy To The Rescue Game helps kids learn the sequence of the alphabet. A scoring system helps to monitor and track the progress of the child. Bing Note is an educational company, focusing on educating young children between the ages of 2-6, in an innovative and fun way. Music is such a powerful learning tool, and songs, rhymes, and rhythm are used to teach children basic skills. Arlene Richards, the creator of Bingzy’s ABC Song and co-founder of Bing Note, spent over 40 years teaching children, both in the classroom and one-on-one. Bingzy’s ABC Song was used in the classroom for decades with proven success. It was a success, because the students enjoyed the song so much, that they were singing the letters and sounds of the alphabet in no time, with very little effort. Bing Note’s products are primarily developed by educators with numerous years of experience teaching in the classroom. Bing Note believes children should have fun learning new skills. Once this happens, they will naturally develop a love for learning. As children develop a love for learning, they become more self-confident in themselves and what they can achieve. Bing Note inspires children to learn, laugh, and love. For more information about Bing Note, please contact Lisa Love at 510-332-0779 or lisa(at)bingnote)dot)com.